Can you tell us the name of your hometown and a little bit about your life growing up? How would you compare childhood then to childhood now? I grew up in two small towns just north of Boston Massachusetts: Melrose and North Reading. One of the things I remember most about those years is what is so different from childhood now – the freedom. Except for school, which we always walked to, our time was very unstructured. There were no video games to become addicted to and in grammar school, no homework. Saturdays as soon as breakfast was over and our beds made and rooms straightened we were free for the day. There were woodsy areas nearby and we often played there, making up fantastic worlds to inhabit. We roller skated (with the kind of skates that cinched onto your shoes with a small key), no helmets, no elbow or knee pads and in spite of creating jumps and other obstacles, we never managed to get more than scrapes on our knees. We came home when the street lights came on or we got hungry. Behind the house across the street in North Reading there were abandoned chicken coops – long low buildings we could climb up on top of – where we had crazy games of cops and robbers or cowboys and Indians complete with cap pistols. I did have dolls at some point in my life, but I was more tomboy than girly girl. I had a paper route to earn pocket money and learned responsibility for myself far earlier than kids today. If I messed up, I had to fix the problem myself. I had chores around the house as well, but not for an allowance – it was just expected of us and part of the family. History, sewing, crocheting, beach combing, swimming, and boating. What inspired the first story you ever wrote in high school and what was it about? Where are some places you travelled as a Peace Corps Volunteer? What are some important life lessons you learned during that time? My country of service in the Peace Corps was Tonga, a tiny island nation in the South Pacific. 172 islands spread out over hundreds of kilometers of ocean. I lived with a family there and learned to slow down and “really” smell the flowers. It was a beautiful place to serve and the people were wonderfully welcoming. I lived with a family who took care of me as if I was one of their own. The biggest challenge was learning to fit my well developed (I was 56 at the time) American work ethic into a very different sort of world. It truly was “Island Time” and everything would get done – mañana, or in Tongan – ‘apongipongi. But for all the conveniences Americans expect that we didn’t have, there were no hungry people, no orphans and no homeless. I thoroughly enjoying living in that loving, communal society where everyone looked out for everyone else. Shortly after I arrived in my village, the local elementary school cancelled classes because it was raining and drumming on the tin roof so hard no one could hear anything. I was appalled to see all these kids swarming loose on the main street knowing some of their parents had no idea they were out of school and some would be working and not home anyway. But after I’d been there awhile, I realized that everyone was looking out for those children, even siblings or neighbor kids only two or three years older than they were, cautioning and guiding and making sure they got home okay and had something to eat even if mom wasn’t there. When someone died the entire village and families from villages all over the island came to mourn with the grieving family throughout the night while all the church choirs took turns singing, all night long until the funeral the next morning. Why do you think a lot of people will find someone who watches TV lazy, while someone who reads fiction as intellectual when both are forms of entertainment where you immerse yourself in a different world? Well, some folk think sitting around reading a book is lazy. We are far too prone to judging others, no matter what they choose to do with their time. But considering the obesity problems in both adults and children in this country, all of use should probably turn the TV off and put the book down and get outside, get some fresh air, take a walk, get exercise, play with your dog, ride a bike, go swimming, play tennis or golf. But it’s still a balance. Reading exercises the brain while television probably does not, unless you spend all your time on PBS or the Discovery Channel. Between the characters Brianna Reagan (Trusting Will) and Elena Castillo (Healing a Hero). who would you rather like to sit down and have an afternoon tea with? Which of your characters did you have the most difficulty creating and why do you think that is? That’s a tough question. I loved both of those characters, for different reasons. Some say there is always a little bit of the author in our characters and I would have to say that’s definitely true with Elena Castillo. I was as young, impetuous and eager to embrace all that life had to offer, including exploring my sexuality, getting away from home, being on my own, and finding new adventures as Elena was at nineteen, so it was easy to create her younger self. I also endured the breakup of my first marriage (for far different reasons than Elena) so I knew what it was like to be divorced and a single parent. Brianna was also a single parent so I had personal experience to lean on there, but I’d not lost a husband who been killed in combat. I could only imagine how devastating that might be and how eager she would have been to protect herself from being hurt again in the same way. Another piece of me in Brianna is her desire to have a cause outside of herself and her immediate family to be passionate about. Although I’ve never gotten involved in restoring local history, I have volunteered in a number of causes all my adult life. But since Brianna and Elena are now sisters-in-law, perhaps I could have afternoon tea with both of them? And don’t forget Meg and Zoe. What is the meaning behind the name of the series "The Camerons of Tide’s Way"? How big of a role do you think a book's name plays? 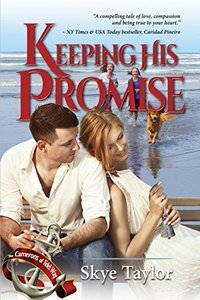 No deep meaning here – each book in the series is about one of the Cameron siblings (Keeping His Promise is the sister Kate’s story coming later this year.) and they all grew up in my fictional town of Tide’s Way, North Carolina. And they ended up settling there as well. The other thing that today’s authors need to keep in mind is marketing. Especially with Amazon being the elephant in the room. Pick a title that’s different. My first book came out under the title Whatever It Takes (Re-released under the title The Candidate) and it turned out there were a dozen books by that title and without a big publishing house with a big marketing department pushing your books and making sure they get noticed, you’ll end up on the second page where no one ever goes. My most recent book, Iain’s Plaid, turns up right on time when hunting for it on Amazon, The Candidate, not so much. Where do you usually find the inspiration for your male characters? What about your female ones? In my romances I think all my heroes are men I think I could fall in love with if they were real. I give them traits that appeal to me and flaws I know I could live with and understand and be sympathetic to. I also read a lot of books written BY men to get a feel for how real men think and act and talk. In The Candidate, I was doing research for something else and the premise for that book just came to me so that protagonist, my hero, was more complex in the making. My brother had been a soldier in Vietnam so some of what went into creating Matt Steele came from things my brother had shared with me about that experience. But the story takes place in 2016, so it’s not about the soldier or that time, but about how that experience could have impacted his life 40 years down the road. In my historical romance (Iain’s Plaid,) which is a time travel, I had to research what would be different about that time and the men who lived in it. My female characters, as I mentioned earlier, all have some bits and pieces of me in them, but they also have bits and pieces of women I admire: friends, my daughters, women I’ve worked with and for. 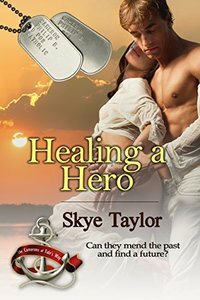 In Healing A Hero, there is a teenager named Julie who was inspired by my granddaughter, also named Julie. My granddaughter was also my go-to for answers to who she might like as celebrities, in music, speech and other teenage things that are so far in my past I’ve forgotten them or because the times have changed so drastically, I never experienced in the first place. Why do you think there is such a fascination with time travel and what are some of the dos and don’ts one has to follow when writing this genre? I think probably everyone has read a book, even a history book, or seen a show set far in the past and wondered what it might have been like. The fascination comes from the alluring possibility of actually going back in time and experiencing it first hand. Of course, we skip over the uncomfortable things about the past so it ends up seeming very romantic. We don’t mention outhouses (at least not in all their stinking glory) or what it might be like to have a bath only once a month – if you were lucky. Then there are all the intriguing possibilities of the future. Who hasn’t asked what if? about things that haven’t yet been invented? But either into the past or forward to the future, there has to be a leap of faith, if you will. Some vehicle that makes that trip possible or at least sounds possible. In Diana Gabaldon’s Outlander series, that vehicle was a standing stone on Craigh na Dun. Since there is a lot of speculation about standing stones wherever they’re found, that makes a convincing possibility. In Iain’s Plaid there’s something about the island of Damariscove itself. My heroine first notices it as she sails through an inexplicably flat patch of ocean, then later in the makeshift museum and finally in the empty space under the long abandoned stone steps. In Chris Van Allsaburg’s The Polar Express that vehicle is the train itself that somehow takes its riders to a city at the top of the world where Santa Clause lives. But whatever that vehicle/place is that allows people to slip through time to the past, or the future or some imaginary world, it must be consistent. Whatever rules have been chosen by the author, they must be followed to allow the reader to make that leap of imagination. Is there any symbolic meaning behind Iain MacKail from "Iain's Plaid" being a Scotsman? Do you think it is important for a writer to include a diverse selection of characters in their stories? There is a reason Iain MacKail is a Scot, but not a symbolic one. He was just a boy at the time, but he lost a great deal when the British army defeated the Scots at Culloden and then systematically dismantled the highland way of life in the years that followed. Now here he is, faced with British tyranny in a new land. He’s an adult now and he has a lot to lose taking a stand against such a powerful monarchy, but he does it because he believes it’s the right thing to do. Putting his life and livelihood on the line for a cause he fears can’t succeed says a lot about his character and the kind of man he is. As for diversity in your characters, I think it would be a pretty dull book if they were all pretty much the same. But that diversity has to fit the time and place. I set my story on and island where many different European men had settled so it made sense for there to be Frenchmen, Scots, Irish, and English. I could have just as well included Germans, Algonquins or other local American Indian tribes. In a setting with a more homogenous society, there would still be diversity. Everyone could be blond and blue eyed, or Hispanic or whatever, but there would still be crotchety old men, bossy women, kids of all ages and temperaments, young lovers and jaded businessmen. And that diversity is what adds color and depth to our stories. 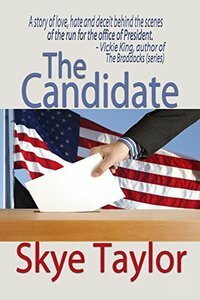 What inspired you to write the political fiction novel "The Candidate"? In what ways was this book easier or harder to write and how did it differ from your other books in terms of your writing process? While I was researching for a different book, I read about the “Dust of Life” which is the term the Vietnamese use for children born out of wedlock and especially during the time of the American-Vietnam War born of a union between a Vietnamese woman and an American soldier. Often they were abandoned, even by their mothers, and grow up in orphanages because they were less than whole, having no father to claim them. And I wondered what it might be like for a man to discover he had unknowingly left a child behind many years later. Would it bring back all the long-buried memories of his time in a war zone and the nightmares and heckling that followed him home? The book started out as just that – I chose the setting because while running for the highest office in the land would be a very difficult time to have to come to terms with all that. As the book got revised and edited, I decided to include the other candidates and their battles. At one point in the major re-write, I felt like a had the reins for half a dozen horses all pulling in different directions and thought I’d never gain control, but wise words from an author at a conference I attended suddenly gave me a handle for pulling it all together. 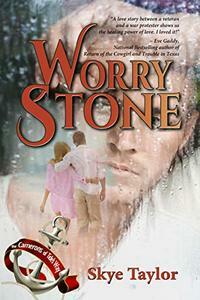 It was a far harder book to write than all my romances for that very reason. Instead of just a hero and a heroine and their conflicts, I had three candidates and two other characters who all had things going on that had to come together to resolve the story. 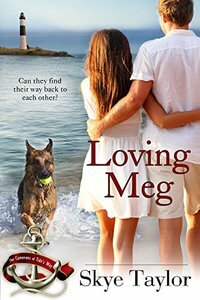 The romances were less complicated, so perhaps easier to write, but creating a good story and drawing your reader into your world is the goal in any book. As for process, I am what is called a “Pantser” meaning I write from the seat of my pants as opposed to a “Plotter” who has a detailed plot all worked out in advance. All my books, including The Candidate were written this way. I always have a very clear idea of where my characters will end up, but I don’t have a road map of how I will get there. Almost always I have the final chapter written before I even begin because that vision of where I’ll end up is so clear to me, and perhaps with that finale in mind it helps keep me on the path to getting there. What do you enjoy most about being an author? What are some disadvantages to being an author? I love creating my characters: deciding on names, backstories, facial features, body types, personalities, families etc. Then, because I’m a pantser, I enjoy the ride to the end as much as my readers. Disadvantages to being an author? Well, one would be you never really take a vacation. Even if you travel without your laptop and plan to stay away, your characters are still there in your head talking to you, giving you suggestions you would be smart to write down even if you are “on vacation” lest you get home and realize you had such a great idea and now you can’t remember what it was. How would you describe your journey as an author so far and what are some things you've learned along the way? I wrote my first book in pencil on yellow lined pads of paper. I still have it, buried at the back of a file drawer and I’m sure not fit to see the light of day. Between then and now I’ve learned so much and I’m still learning. Although I still like the adventure of finding out what happens to my characters as the story unfolds, I’ve learned that besides having the final chapter clearly envisioned, I do need at least a minimal roadmap. Otherwise I end up with lots of side trips that don’t really add anything to the story and end up having to be discarded and that’s a waste of time. I’ve also learned to keep a detailed cast of characters so I can keep them consistent, especially with a series. I’ve also learned that if I write my characters’ backstories before I start to write the book, I know them a whole lot better and I know how they’re going to react no matter what I throw at them. Probably the most important thing I’ve learned, from a man named T. Davis Bunn who gave a terrific workshop at a conference I attended at the Space Coast was the idea that every character arc intersects at some point with your main character and from that point on he or she is either for or against your protagonist. That one bit of advice was what helped me to gain control of all the runaway conflicts in The Candidate. It also helps me keep my hero and heroine on the right track when writing a romance. 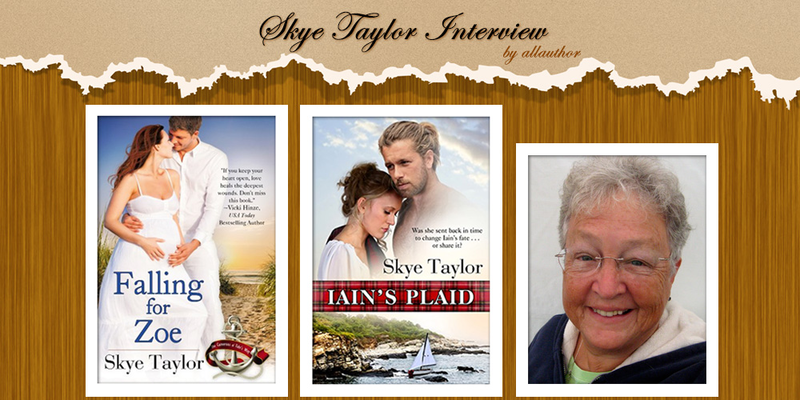 Author Skye Taylor grew up in two small towns just north of Boston Massachusetts: Melrose and North Reading. 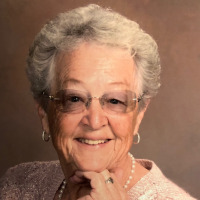 Some of her hobbies include history, sewing, crocheting, beachcombing, swimming, and boating. Throughout her junior and senior year in high school, she had the same teacher who challenged her to put more effort into her writing. She wrote her first book in pencil on yellow lined pads of paper. Skye also served with the Peace Corps in the island nation of Tonga in the South Pacific. Skye likes creating male characters that she could fall in love with; female characters inspired by herself and the women she admires and strongly believes that diversity in characters is what adds color and depth to stories.